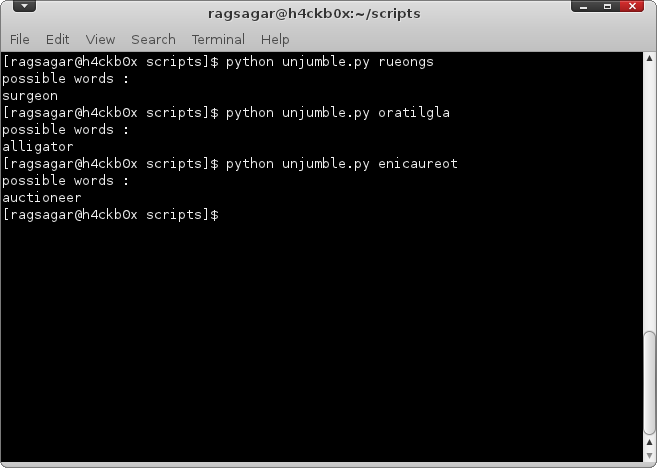 Here is a python script to find solution for a jumbled word. Give a jumbled word as parameter, it will list the possible solutions.
""" Return a list of dict words """
""" Return a list of possible solutions """
Don’t forget to change the ‘dictfile’ to the wordslist file you have in your system. Here is the screenshot of script output. Here is a python script to wish you Good Morning or Good Evening according to the time of the day. Now if you want to display it when you open the console add the following line to your ~/.bashrc file. This time its the script to fetch the malayalam meanings of english words from malayalam wiktionary. print "No definition found "
print "Unable to connect to internet "